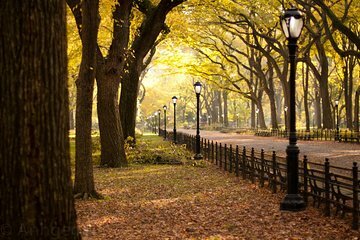 Bei einem 2,5-stündigen Rundgang können Sie bei Sonnenuntergang gemütlich durch den Central Park spazieren. Besuchen Sie über 20 berühmte Sehenswürdigkeiten im Park, darunter den Bethesda-Brunnen, den Central Park Zoo, die Bow Bridge und die Strawberry Fields. Erfahren Sie in Ihrem informativen Reiseführer mehr über die Geschichte von New York City und den Central Park und genießen Sie eine Reihe von Quizfragen und Fakten. Very informative and fun tour! Wyatt did our tour and he was GREAT!!! Walked a lot but didn't even realize it because we were so interested in what he was telling us. Would highly recommend this tour. My husband wasn't that interested in going, but afterwards said he was REALLY glad I booked it. Truly magical experience on tour with Wyatt as our guide! unique way to visit Central Park for the first or any time. I was new to New York so had fun finding the meeting point. However Matt was delightful. I learnt about the history of the park and New York in an entertaining way. Matt loved explaining which movies had filmed in Central Park so will now look out. You do walk 4 miles and I was surprised how undulating Central Park was so was really pleased to have a stop for food, drink and loo slightly over half way I had just flown into New York at lunchtime. My highlight was seeing the racoons. Matt kindly saw me onto the metro and showed me how to use the ticket machines I was definitely flagging at that point. Really enjoyable tour with informative friendly guide. In contrast to everything else you're likely doing in the city this is relaxing and quiet !! What a wonderful way to see Central Park! Our guide was informative and was able to answer most every Park related question anyone asked. We saw iconic places as well as lesser known spots. He told us plenty of stories related to the founding of the Park as well as stories of restoration in the last 30 years. What a great tour. The guide walked us through the entire park. It was so beautiful. Highly recommend this tour! A real eye opener to how Central Park came to exist and the changes that it has undergone since its first development!